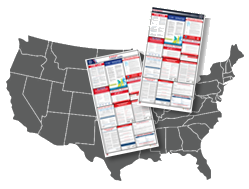 Across the U.S., employers are required to display state and federal labor / employment notices in a conspicuous location to help maintain compliance with state and federal labor posting requirements. Now employers and Human Resources professionals can order U.S.-made labor law posters from the same source they trust for top-quality safety and office signs: ComplianceSigns.com. These 2018 employment posters combine state and federal notices into one easy-to-hang poster that displays up-to-date mandatory federal and state labor / employment notices for private industry or non-government entities. We've researched and developed posters for all 50 states plus the District of Columbia, and all have been reviewed by a licensed attorney. We've done the research so employers can use them with confidence. Our easy-to-read labor law posters are offered in two color options. All are printed on bright white, 8 mil coated paper with a clear protective laminate on the front to resist stains, scratches and fading. They are currently priced at $30 or less, and ship quickly from our plant in Illinois. Generally, federal workplace posters must be displayed or posted in conspicuous places where they are easily visible to all employees. The FMLA, EEO, and EPPA posters are also required to be placed where they can be seen by applicants for employment. Failure to post required federal notices may result civil money penalties, contract actions or legal sanctions, depending on the notice. With a few exceptions (FMLA, MSPA and Executive Order 13496), regulations do not require posting of notices in Spanish or other languages. Posting requirements vary by statute. Since not all employers are covered by each statute, some employers may not be required to post a specific notice. For example, some small businesses may not be covered by the Family and Medical Leave Act and would not be subject to the Act's posting requirements. You may wish to consult with legal counsel regarding posting requirements for your business. Most states also have employment notice posting regulations. ComplianceSigns.com has researched the specific notices required for each state. Some states, including New York and Texas, require different posters depending on the employer's worker's compensation coverage or some other status. We have created separate posters to meet these unique requirements, as well. Some local governments may dictate additional notices. Check local laws. State Labor Offices - List of all states and their labor office contact information. State Occupational Safety and Health Plans - Links to states with Occupational Safety and Health (OSH) plans. Includes a state plan directory of contact information. Selected State Labor Laws - A comparison of federal and state laws regarding the Family and Medical Leave Act (FMLA), a list of links to tables comparing various state laws relative to the Fair Labor Standards Act (FLSA), including minimum wage and overtime rules, and links to state labor associations. Federal Department of Labor Poster FAQ page. Dept. of Labor elaws Poster Advisor. ComplianceSigns.com Labor Law Posters page. Are Music Headphones a Workplace Hazard? GHS Delayed Again Over "Unclassified Hazards"
ComplianceSigns.com. Simple theme. Powered by Blogger.